When it comes to trying new skincare, it can be quite a bit of an investment – sure, there might be hype on blogs, or big claims in magazines or even just amazing advertising. But if I could have a tenner for every time I’ve wasted some money on a product based on hype/advertising and then been left disappointed. 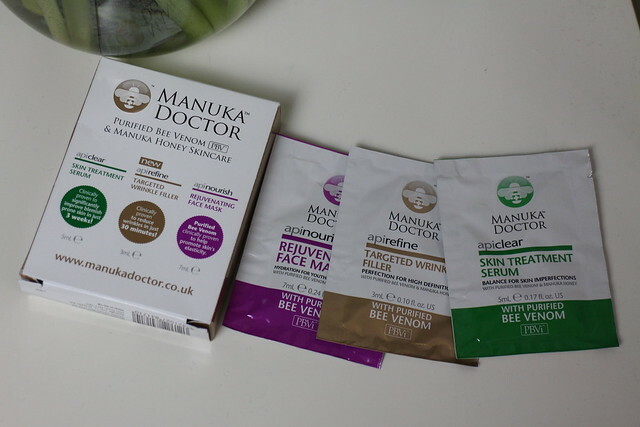 This is why I wish there were more brands doing things like Manuka Doctor are at the moment – where they’re giving away a free (yes, free) ‘Try Me’ kit of the brand’s trio of best sellers – all you need to do is pay a couple of quid for postage. I think a little try me kit is an even better idea for a brand like Manuka doctor – it’s one that has been much hyped in magazines due to it’s key ingredients of ‘bee venom’ and manuka honey, but it is one that you could question on the performance side. So what better way to find out what the hype is about, than to try out the brands top sellers for just a couple of quid (delivery charge only). The try-me kit contains the Skin Treatment Serum, Targeted Wrinkle Filler and Rejuevating Mask (which is probably the most famous thing from the brand). The sachets are each between 3ml and 7ml, so not huge – but enough to give yourself a taste before you go full investment. Plus along with the try-me purchase, you also get a little 25% discount code – so if you do decide to buy the full size, you get a bit of money off. I can definitely recommend the mask – it’s one that gives your skin an instant boost and refresh. I’ll be sharing a full review of that very soon. I swear by Manuka honey for health benefits and to combat a cold but never tested its properties as a beauty product. Gunna have to sample these myself!